This price is for 3 hours, additional hours are at $150/hour. This wall is designed to fit through a standard double-door, providing access for most indoor facilities such as malls and indoor gymnasiums. At 18 feet (5.49 meters) tall this wall is perfect for indoor locations with ceiling height constraints. 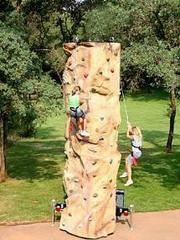 Our customers who cater towards younger participants feel that the Aspire Mobile 2 Climber is perfect for their business. 1 Attendant provided. If there is a travel fee for delivery to your city, you will also need to include an additonal travel fee for the attendant.